Bu araştırmada PISA-2009 öğrenci anketinde bulunan okula ve öğretmenlere ilişki algı alt testlerinde yer alan maddelerin DMF açısından 4 farklı ülke (Türkiye, ABD, İrlanda ve İngiltere) ve cinsiyete göre ele alınarak karşılaştırmalı olarak araştırılması amaçlanmıştır. Araştırmada kullanılan maddeler çoklu puanlandığı için DMF analizinde aşamalı tepki modeli altında kullanılan olabilirlik oranı testi (likelihood ratio test) tercih edilmiştir. DMF analizlerine geçmeden önce öncelikle MTK’nın tek boyutluluk varsayımı test edilmiş ve veri gruplarına ayrı ayrı DFA uygulanmıştır. DFA analizleri sonucunda alt testler için test edilen tak faktörlü ölçme modelinin doğrulandığı ve MTK’nın tek boyutluluk varsayımının karşılandığı ortaya konmuştur. Ölçeklerdeki maddelerde DMF bulunup bulunmadığı MULTILOG programı yazılımı ile analiz edilmiş ve okul öğrenmelerine ilişkin algı alt ölçeğinde cinsiyete göre 2, IRL-ING örneklemlerinde 1, ABD-İngiltere’de 2 ve ABD-Türkiye’de 4 maddede, öğretmenlere yönelik algı alt ölçeğinde ise cinsiyete göre 1, İrlanda-İngiltere örneklemlerinde 1, ABD-İngiltere’de 2 ve ABD-Türkiye’de 4 maddede DMF bulunduğu istatistiksel olarak ortaya konmuştur. This study was aimed to assess items of PISA-2009 student questionnaire’s subscales of “sense of school learnings” and “sense of teachers” in terms of differential item functioning by using gender and 4 different country data comperatively. For the DIF analysis, likelihood ratio test was preferred in graded response theory based on item response theory (IRT) because of polytomously scored items. Confirmatory factor analysis (CFA) was used for data sets saperately to test the unidimensionality assumption of IRT. CFA analysis showed that unifactorial construct of subtests was confirmed and unidimensionality assumption of IRT was met. DIF analysis were carried out by MULTILOG software and 2 items for gender, 1 item for Ireland-GBR sample, 2 items for USA-GBR sample and 4 items for Turkey-USA sample was flagged as DIF in the subscale of “sense of school learnings”. In the subscale of “sense of teachers”, 1 item for gender, 1 item for Ireland-GBR sample, 2 items for USA-GBR sample and4 items for USA-Turkey sample were flagged as DIF. Asil, M. ve Gelbal, S. (2012). PISA öğrenci anketinin kültürler arası eşdeğerliği. 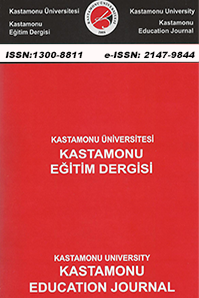 Eğitim ve Bilim, 37(166), 236-249. Atalay, K. (2010). PISA 2006 öğrenci anketinde yer alan tutum maddelerinin değişen madde fonksi- yonu açısından incelenmesi. Yayınlanmamış Yüksek Lisans Tezi. Hacettepe Üniversitesi, Ankara. Ackerman, T.A. (1992). A didactic explanation of item bias, item impact and item validity from a multidimensional perspective. Journal of Educational Measurement, 29(1), 67-91. Bolt, D.M. (2002). A Monte Carlo comparison of parametric and nonparametric polytomous DIF detection methods. Applied Measurement in Education, 15(2), 113-141. Byrne, B.M. (2001). Structural equation modeling with AMOS, EQS, and LISREL: Compa- rative approaches to testing for the factorial validty of a measuring instrument. Internati- onal Journal of Testing, 1(1), 55-86. Byrne, B.M., Shavelson, R.J. ve Muthen, B. (1989). Testingfor the equivalence of factor co- variance and mean structures: the issueof partial measurement invariance. Psychological Bulletin, 105 (3), 456-466. Camilli, G. veShepard, L.A. (1994). Methods for Identifying Biased Test Items. ThousandO- aks. Sage Publications. response model. Applied Psychological Measurement, 17(4), 335-350. Embretson, S.E. and Reise, S.P. (2000). Item Response Theory for Psychologists. Lawrence Erlbaum Associates, Inc., New Jersey, USA. Gillapsy, J.A. (1996). A Primer on Confirmatory Factor Analysis. Paper presented at the Annual Meeting of the Southwest Educational Research Association. New Orleans, LA. (Eric document reproduction service no: ED 395 040). Hableton, R.K. and Swaminathan, H. (1985). Item Response Theory. Kluwer-Nijhoff Publishing, MA, USA. Hambleton, R. K., Swaminathan, H. and Rogers, H. (1991). Fundamentals of Item Response Teory. Newbury Park CA: Sage. Hu, L. & Bentler, P.M. (1995). Evaluating model fit. In R.H. Hoyle (Ed. ), Structural Equation Modeling: Concepts, Issues and Applications (pp. 76-99). Thousand Oaks, CA: Sage. Lautenschlager, G.J., Flaherty, V.L. and Park, D.G. (1994). IRT Differential item functioning: An examination of ability scale purifications. Educational and Psychological MeasureMent, 54, 21. Lee, K. (2003). Parametric and Nonparametric IRT Models for Assessing Differential Item Functioning. Unpublished Doctoral Dissertation. Wayne State University, USA. Kamata, A. and Vaughn, B. (2004). An introduction to Differential item functioning analysis. Learning Disabilities: A Contemporary Journal, 2(7), 49-69. Kim, S.H. ve Cohen, A.S. (1998). Detection of differential item functioning under the graded res- ponse model with the likelihood ratio test. Applied Psychological Measurement, 22, 345-355. Maij-de Meij, A.M., Kelderman, H. and van der Flier, H. (2010). Improvement in detection ofdifferential item functioning using a mixture item response theory model. Multivaria-te Behavioral Research, 45, 975-999. McDonald, R.P. (1982). Linear versus models in item response theory Applied Psychological Measurement, 6, 379-396. MEB (2009). PISA 2009 Uluslararası Öğrenci Değerlendirme Programı Ulusal Ön Rapor. MEB, Ankara. Messick, (1989). Meaning and values in test validation: The science and ethics of assessment. Educational Researcher, 18(2), 5-11. Samejima, F. (1969). Estimation of latent trait ability using a response pattern of graded sco- res. Psychometrika Monograph, No: 17. Sheng, Y. (2005). Bayesian Analysis of Hierarchical IRT models: Comparing and Combining the Unidimensional and Multidimensional IRT models. Unpublished Doctoral Dissertati- on. University of Missouri-Columbia. Sijstma, K. & Hemker, B.T. (2000). A taxonomy of IRT models for ordering persons anditems using simple sum scores. Journal of Educational and Behavioral Statistics, 25 (4), 391-415. Stapleton, C. D. (1997). Basic concepts in exploratory factor analysis as a tool to evaluate score validity: A right-brained approach. 25Kasım 2006 tarihinde http://ericea.net/ft/tamu/Efa.htmadreinden erişildi. Taub, G. E. (2001). A confirmatory analysis of the wechsleradult intelligence scale-third edition: is the verbal/ performance discrepancy justified?Practical Assessment, Research and Evaluation, 7(22). Thissen, D., Steinberg, L. and Gerard, M. (1986). Beyond man group differences: The concept of item bias. Psychological Bulletin, 99, 118-128. Zumbo, B.D. (1999). A Handbook on the Theory and Methods of Differential Item Functioning (DIF): Logis- tic Regression Modeling as a Unitary Framework for Binary and Likert-Type (Ordinal) Item Scores. Ot- tawa, ON: Directorate of Human Resources Research and Evaluation, Department of National Defense. ISNAD KÖSE, İbrahim Alper . "PISA 2009 Öğrenci Anketi Alt Ölçeklerinde (Q32-Q33) Bulunan Maddelerin Değişen Madde Fonksiyonu Açısından İncelenmesi". Kastamonu Eğitim Dergisi 23 / 1 (January 2015): 227-240.